2018 Fellow, Australasian Fluid Mechanics Society. 2018 American Society of Civil Engineers, Environmental and Water Resources Institute (ASCE-EWRI) Honorable Mention Paper Award for "Minimum Specific Energy and Transcritical Flow in Unsteady Open-Channel Flow" by Castro-Orgaz and Chanson (2016) in the ASCE Journal of Irrigation and Drainage Engineering. 2018 Institution of Civil Engineers (UK) Baker Medal for the paper "Hydraulic jumps and breaking bores: modelling and analysis", published in the Journal Engineering and Computational Mechanics (Vol. 170, No. 1, March 2017, pp. 25-42). WANG, H., LENG, X., and CHANSON, H. (2017). "Bores and Hydraulic Jumps. Environmental and Geophysical Applications." Engineering and Computational Mechanics, Proceedings of the Institution of Civil Engineers, UK, Vol. 170, No. EM1, pp. 25-42 (DOI: 10.1680/jencm.16.00025) (ISSN 1755-0777). (PDF file) (Reprint at UQeSpace). 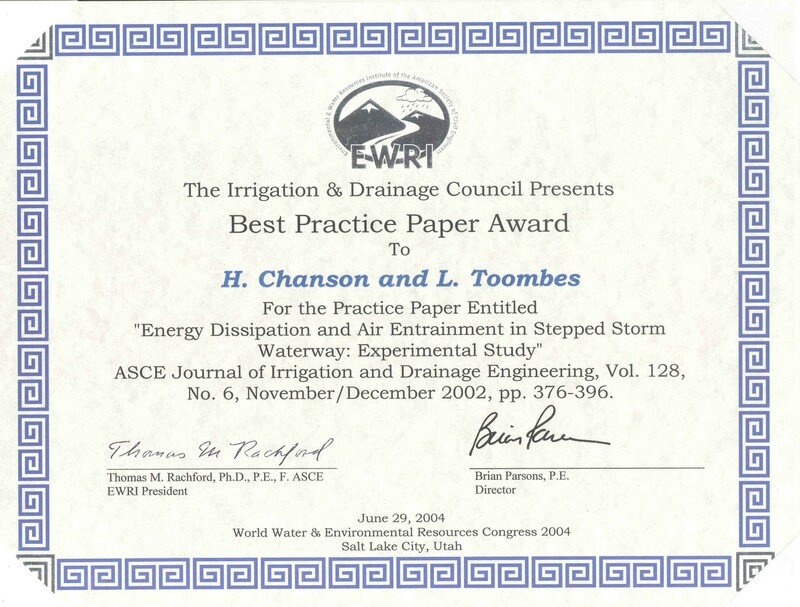 2004 American Society of Civil Engineers, Environmental and Water Resources Institute (ASCE-EWRI) award for the best practice paper in the Journal of Irrigation and Drainage Engineering (Award document). 2008-2009 Invitation Fellowship, Japan Society for the Promotion of Science : "Turbulence and Turbulent Mixing in Estuarine Zones and Shallow-Water Bays". 2008-2009 Scientific Exchange with Europe (France), Australian Academy of Science. 2003-2004 Scientific Exchange with North-America (Canada), Australian Academy of Science. 2001/02 Visiting Research Fellow, Japan Society for the Promotion of Science. 2001 Scientific Exchange with Japan, Australian Academy of Science. 1999 Doctor of Engineering, University of Queensland, Australia. 1999 Visiting Research Fellow, Japan Society for the Promotion of Science. 1999 Scientific Exchange with Japan, Australian Academy of Science. 1997 University of Queensland Travel Grant. 1995 Visiting Associate Professor at National Cheng Kung University, National Science Council of Taiwan. 1995 Scientific Exchange with Taiwan, Australian Academy of Science. 1994 Australia-France Foundation Fellowship under the Bédé Morris Fellowship Scheme, Australian Academy of Science. 1994 Scientific Exchange with Taiwan, Australian Academy of Science and National Science Council of Taiwan. 1993 University of Queensland International Collaboration Research Award. Rui SHI, Engineers Australia's 2017 W.H.R. Nimmo Award. Rui SHI, 2017 Sir Charles Burton Prize, University of Queensland, October. 2017 Undergraduate thesis : "Physical Modelling of Air Bubble Entrainment and Turbulent Scales in Two-dimensional Vertical Plunging Jet Flows." Urvisha KIRI, Engineers Australia's National Committee on Water Engineering 2017 Student Scholarship Award. Xianqian LENG, 2016 Graduate School International Travel Award (GSITA), The University of Queensland. Gangfu ZHANG, 2016 Graduate School International Travel Award (GSITA), The University of Queensland. Martina REICHSTETTER, 2012 University of Queensland Dean’s Award for Research Higher Degree Excellence for the M.Phil Thesis: "Hydraulic Modelling of Unsteady Open Channel Flow: Physical and Analytical Validation of Numerical Models of Positive and Negative Surges" (Top 10 % of UQ Theses graduating in 2012). Hang WANG, 2012 Graduate School International Travel Award, The University of Queensland: "Optimum design of hydraulic jump energy dissipators". Nazanin KHEZRI, 2012 Graduate School International Travel Award, The University of Queensland: "Hydraulic modelling of tidal bores". Stefan FELDER, 2011 Graduate School International Travel Award, The University of Queensland : "Optimum design of stepped spillways and energy dissipators". Martina REICHSTETTER, 2011 Graduate School International Travel Award, The University of Queensland : "Hydraulic modelling of positive and negative surges: physical and analytical validation of numerical models". Mark TREVETHAN, 2008 University of Queensland Dean's award for Research Higher Degree Excellence for the Ph.D. Thesis: "A Fundamental Study of Turbulence and Turbulent Mixing in a Small Subtropical Estuary" (Top 10 % of UQ Theses graduating in 2008). Mark TREVETHAN, 2005 Graduate School Research Travel Award, The University of Queensland : "Turbulent mixing and dispersion in the sub-tropical estuaries of Southeast Queensland". Carlos GONZALEZ, 2003 International travel Award, University of Queensland, : "Hydrodynamics of Two-phase Flows on stepped spillways." Chantal DONNELLY, 2001 IEAust Michael Woodhouse Prize, Institution of Engineers, Australia, Queensland Division, October. Research Seminar : "Hydraulic modelling of an undular tidal bore". Matt EASTMAN, 2001 Sir Charles Burton Prize, University of Queensland, September. 2000 Undergraduate thesis : "Air entrainment and energy dissipation on stepped spillways." Invited keynote lecture at 2012 NSF Partnerships for International Research and Education (PIRE) Workshop on “Modelling of Flood Hazards and Geomorphic Impacts of Levee Breach and Dam Failure”: "Turbulence in an Urban Environment in Flood: Garden Point Road, Brisbane (Australia) in January 2011", NSF Partnerships for International Research and Education (NSF-PIRE) 14-15 February 2012, University of Auckland, New Zealand. Keynote lecture at the 6th International Conference on Civil Engineering, Isfahan, Iran, May 5-7 : "Hydraulic Engineering into the 21st Century: the Rediscovery of the Wheel ? (1) A Review" (PDF file at UQeSpace), & "Hydraulic Engineering into the 21st Century: the Rediscovery of the Wheel ? (2) New Challenges" (PDF file at UQeSpace). Keynote lecture at the First International Conference of the International Federation for Environmental Management System IFEMS'01 : "The Role of Environmental Fluid Mechanics in Environmental Management", 30 Jan./2 Feb. 2001, Tsurugi, Japan. (PDF file at UQeSpace) (download REPRINT). Keynotes lectures at the Workshop on Flow Characteristics around Hydraulic Structures and River Environment, Water Environment and Mankind, Nihon University, 13 Nov. 1998, Tokyo, Japan : "Review of studies on stepped channel flows" (PDF file at UQeSpace) & "Utilisation of stepped channels and study of stepped channel flows in Australia" (PDF file at UQeSpace). "I would like to express my deep gratitude for your contribution to Workshop on flow characteristics around hydraulic structures and river environment [...]. I believe your lecture was very stimulating and rewarding for all the participants." Y. SEZAI, Nihon University Research Center, 24 Nov. 1998. Invited lecture at 2nd International workshop on the application of fluid mechanics to disaster reduction: Cyclone (hurricane/typhoon/extra-tropical) modeling and damage assessment: "Bores, Surges and Hydraulic Jumps: from tidal bore field measurements to tsunami-induced bore propagation - can we trust hydraulic modelling? ", Sendai, Japan, 16-17 Mar. 2015. Invited lecture at IUTAM Symposium on Bubbly Flows: "Bubbly Flow in Hydraulic Jumps at Large Reynolds Numbers", Oaxaca, Mexico, 9-14 Mar. 2015. Invited lecture at Workshop on Acoustic Tomography and its Applications: "Tidal bore field measurements in the Garonne and Sélune Rivers (France) in 2010, 2012 and 2013: sedimentary processes and turbulence", Hiroshima University, Japan, 12-14 Mar. 2014. Invited lecture at the Nihon University, Koriyama (Japan): "Tidal Bores, Aegir, Pororoca: Field Works, Laboratory, CFD and more…", Nihon University, College of Science and Technology, 10 Oct. 2012, Tokyo, Japan. Invited lectures at the Nihon University, Tokyo: "Hydraulic Jumps, Bubbles, Bores & Undulations" & "Spillway Designs for Embankment Overtopping System and Earth Dams", Nihon University, College of Science and Technology, 5 Oct. 2012, Tokyo, Japan. Invited speaker at 4th International Symposium on Hydraulic Structures ISHS2012: "How to write a good technical paper?" 4th International Symposium on Hydraulic Structures ISHS2012, IAHR, Porto, Portugal, 9 Feb. 2012. Invited speaker and panelist at Engineers Australia: "In the Aftermath of the Brisbane Floods." Society for Sustainability and Environmental Engineering and Water Panel, Engineers Australia, Brisbane, 22 March 2011. Invited seminar at the 32nd IAHR Biennial Congress, Venice : "Digital Publishing, Indexing and Ethics : Implications in Hydraulic Engineering and Research", as part of Seminar on Issues on Education, Undergraduate courses in civil and environmental engineering; Permanent learning; Student mobility and international co-operation, 4 July 2007, Venice, Italy. Invited seminar at the 29th IAHR Biennial Congress, Beijing, 2001 : "Undergraduate teaching of hydraulic engineering at an Australian University", H. CHANSON, as part of SS4 Special Seminars on "Capacity building and assimilation of knowledge". Invited lecture at the International Workshop on Hydraulics of Stepped Spillways : "Experience, operation and accidents with stepped cascades", H. CHANSON, 22-24 March 2000, Zürich, Switzerland. Audio-visual presentation presented at the 27th IAHR Biennial Congress, ASCE/IAHR : "Old stepped spillways : 1700 to 1930s". H. CHANSON, 12 Aug. 1997, San Francisco, USA, Session T30-D28. Hydraulic Colloquium (Lecture) presented at the Research Laboratory for Hydraulics, Hydrology and Glaziologie-VAW, ETH-Zürich : "Hydraulics of Stepped Spillways". H. CHANSON, 13 Dec. 1994, Zürich, Switzerland. Short course lectured at FH Aachen University of Applied Sciences: "Basic Principles of Open Channel Hydraulics", H. CHANSON, 14 May 2018, Aachen, Germany. Short course lectured at IWES: "Principles of Hydraulic Engineering and Open Channel Flow", H. CHANSON, 8-10th November 2017, Brisbane, Australia. Workshop at the 6th IAHR International Symposium on Hydraulic Structures: "Hydraulic Design of Stepped Spillways". Course organised by USSD and IAHR, H. CHANSON and S. HUNT, 27 June 216, Portland OR, USA. Course lecture at Zhejiang Institute of Hydraulics and Estuary: "Turbulence, Turbulence Measurements & Turbulent Data Analyses in Hydraulic Engineering". H. CHANSON, 10 October 2014, Hangzhou, China. Short course lectured at IWES : "Principles of Hydraulic Engineering and Open Channel Flow", H. CHANSON, 15-19 July 2013, Gold Coast, Australia. Short course lectured at IWES : "Principles of Hydraulic Engineering and Open Channel Flow", H. CHANSON, 13-15 July 2009, Gold Coast, Australia. 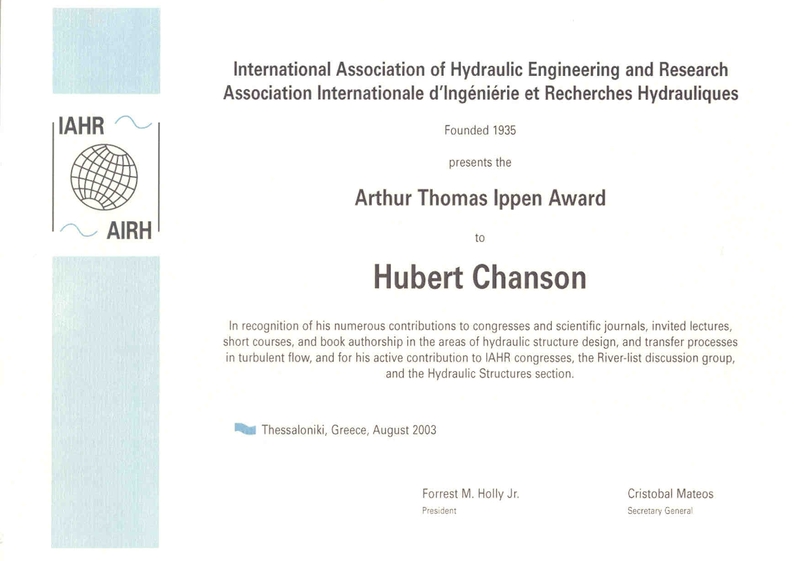 Short course lectured at IWES : "Principles of Hydraulic Engineering and Open Channel Flow", H. CHANSON, 11-12 Feb. 2008, Sydney, Australia. Short course lectured at Aurecon/Connell Wagner and the University of Queensland : "Basic Principles of Open Channel Flow Hydraulics", H. CHANSON, 23-25 Jan. 2008, Brisbane, Australia. Short course lectured at Politecnico di Bari, Coastal Engineering Laboratory LIC : "State-of-the-Art in Hydraulic Engineering", H. CHANSON, Y. YASUDA, M. MOSSA and U. FRATONI, Feb. 2004, Bari, Italy. Short course organised and lectured at the University of Queensland, Dept. 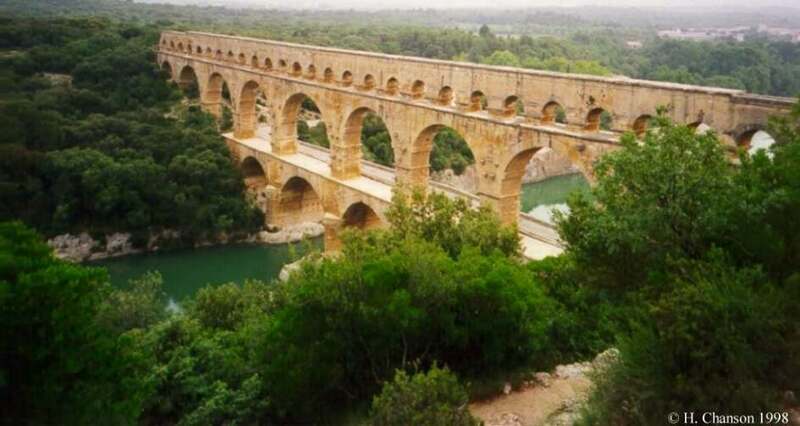 of Civil Engineering : "Hydraulic Design of Stepped Cascades, Channels, Spillways and Waterways". H. CHANSON, 17-18 February 1997, Brisbane, Australia. Short course organised and lectured at the University of Queensland, Dept. of Civil Engineering : "Hydraulic Design of Stepped Chutes and Spillways". H. CHANSON, 7-8 April 1994, Brisbane, Australia.